I can’t believe I’ve never shared this craft before. I’ve made these kind of ornaments at least a handful of times, and I’ve started to make them for the newlywed couples of just about every wedding I attend. Can you tell what it is? 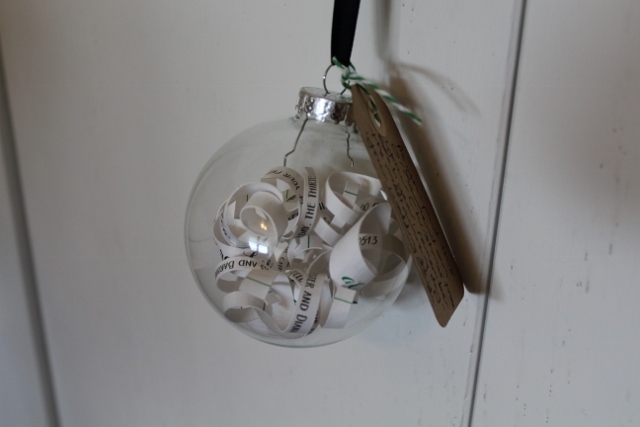 If you thought it was a wedding invitation inside a clear ornament, you’re correct! I saw the idea on pinterest a long time ago, and finally made one from my own wedding invitation a couple years back. When one of my bridesmaids got married in November 2012, I decided to make her one of these ornaments as a Christmas gift just a month later. She loved it, and so began my tradition of making one to give to every newlywed couple whose wedding I attend. Making this DIY gift is quite easy. To start, I cut the invitation into strips that are only as wide as the text. The skinnier the strips are, the better the ornament will look. 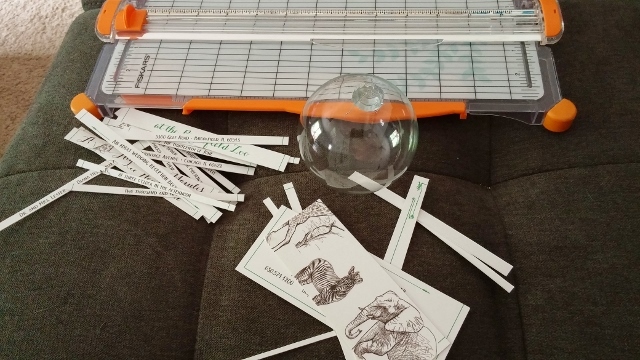 I use a scrapbook paper trimmer, but scissors work just as well. It’s a bit easier to get a straight line with the trimmer though. Next, grab a pen. 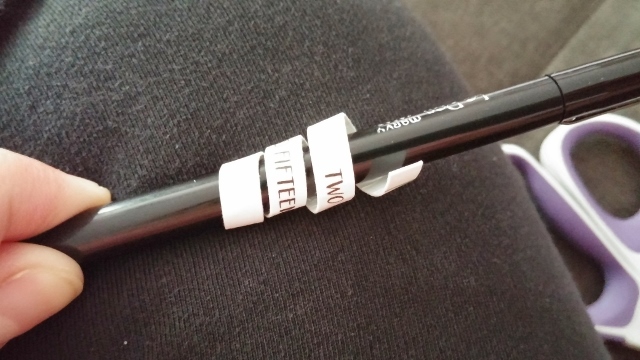 Wrap each strip around the pen, making as tight a curl as possible. You’ll have a more difficult time with wider strips of paper. You’re ready to fill the ornament! Finding these glass ornament is really easy around Christmas time. I usually buy a couple 4 packs during the holiday season from Michael’s, then store them away until I need them. 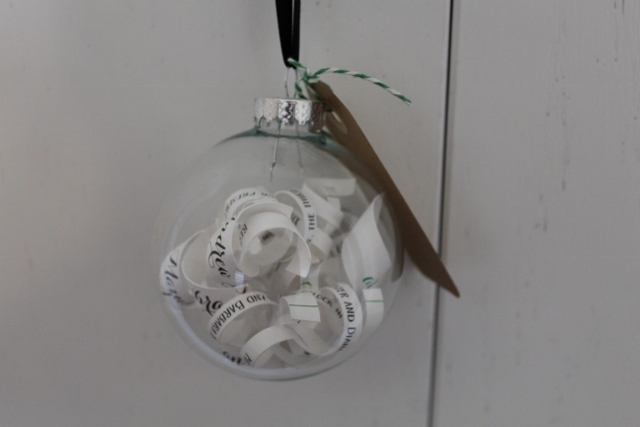 I grabbed an ornament from my stash and put the curled paper strips into it, one by one. If it starts seeming full, give the ornament a shake. You want the ornament to be pretty full, but not too full. 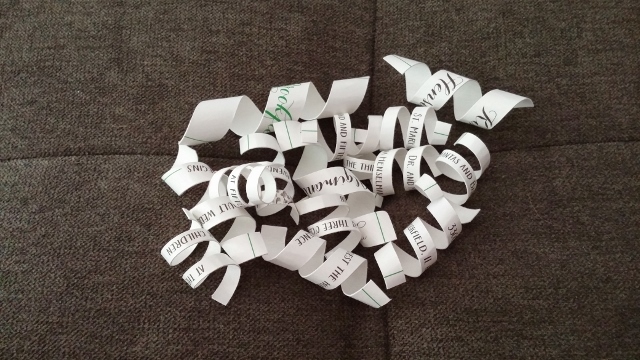 I tend to put the strips with the most important text in first (like bride’s and groom’s names, wedding date, parents’ names) in case not all the strips fit nicely. Once all the strips are inside, I put the top of the ornament back on, tie a ribbon to it, and add a little note to the bride and groom. I smile as I put my wedding invitation ornament on my tree every year, and I hope the lovely bride and her new groom do the same.